Home>Lifestyle> Launching The Jordan Spiz'ike BHM For "Black History Month"
The Spiz'ike is a collabo shoe between Michael Jordan and Spike Lee. Nike first launched the shoe in 2006. 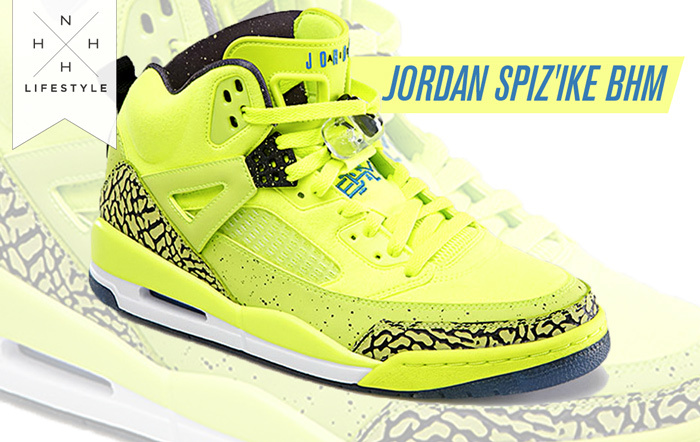 Now it's 2013 and for "Black History Month" they are launching the Jordan Spiz'ike BHM. These mainly consist of the the neon green/yellow throughout the shoe, but also have that touch of blue on the "BHM" and Jordan stamps. You'll also get a kick out the graphical insoles within the Spiz'ike, showing off the true nature of the shoe itself. The colorway alone is enough to turn heads this spring/summer and in honor of BHM, a portion of the shoes revenues will be going to charity. These are a pair of kicks not to sleep on. LIFESTYLE Launching The Jordan Spiz'ike BHM For "Black History Month"